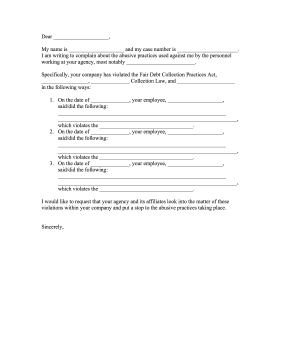 Stop aggressive debt collecting practices with this complaint letter that cites illegal behavior. My name is ____________________ and my case number is ______________________. I am writing to complain about the abusive practices used against me by the personnel working at your agency, most notably _________________________. 1. On the date of ______________, your employee, ____________________, said/did the following: _____________________________________________________________ _________________________________________________________________, which violates the __________________________________. 2. On the date of ______________, your employee, ____________________, said/did the following: _____________________________________________________________ _________________________________________________________________, which violates the __________________________________. 3. On the date of ______________, your employee, ____________________, said/did the following: _____________________________________________________________ _________________________________________________________________, which violates the __________________________________. I would like to request that your agency and its affiliates look into the matter of these violations within your company and put a stop to the abusive practices taking place.